If you think someone is having a heart attack, call an ambulance! The most common signs of a heart attack are chest pain and shortness of breath. But there may be other symptoms as well. A heart attack is a medical emergency. If you think someone might be having a heart attack, it is very important to call the emergency services right away (112 in Germany and many other countries, 911 in the U.S.). People who have heart attacks often have already had coronary artery disease for years. This causes recurring chest pain (angina) or shortness of breath during exercise. Others hardly have any symptoms beforehand – they only find out about their heart problem when they have a heart attack. Some women think that heart attacks are a lot more common in men. That isn’t true, though. Women tend to be older when they have heart attacks, though. More women die of a heart attack than of breast cancer. Heart attacks often start with sudden stinging, burning chest pain or pressure in the chest area. But sometimes the symptoms only develop gradually. The pain goes on for more than five minutes and it doesn’t get better when the person rests. 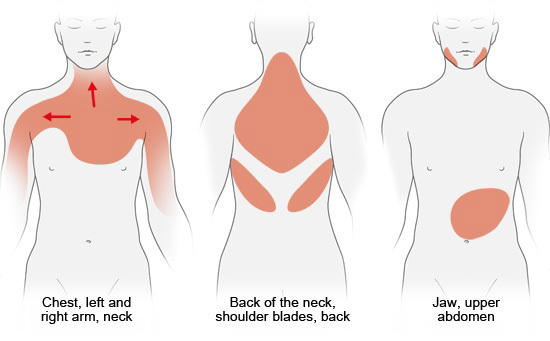 It can spread from the chest down the left or right arm, and it may affect your back, neck or upper abdomen as well. The pain can be very mild or very strong. Some people know they have coronary artery disease, and have often effectively relieved the symptoms using nitrate medication in the past. If they are having a heart attack, this medication will no longer help. People who are having a heart attack often have a sense of impending doom, look pale and sickly, and break out in sweats. Many have difficulties breathing, feel nauseous or vomit. These symptoms may be much more noticeable than the chest pain. Breathing difficulties, nausea and vomiting are sometimes the main signs of a heart attack, particularly in women. For this reason, heart attacks in women are more likely to be overlooked than heart attacks in men. Not only do the signs of a heart attack vary widely from person to person, they may also be very different from the signs of a previous heart attack. Heart attacks that don’t cause any symptoms are known as “silent” heart attacks. Heart attacks are a medical emergency! Every minute counts – life-saving measures should be started as soon as possible in order to limit possible damage. So it’s important to call the emergency services immediately (112 in Germany and many other countries, 911 in the U.S.) if you suspect someone might be having a heart attack – even if you aren’t sure. If signs of a heart attack occur at night, do NOT wait until the next morning to do something about it. if they have prescription medication for stable angina, such as nitrates, give them that. If the person passes out, they stop breathing and their heartbeat stops, they will need CPR (resuscitation) as a first aid measure. Bundesärztekammer (BÄK), Kassenärztliche Bundesvereinigung (KBV), Arbeitsgemeinschaft der Wissenschaftlichen Medizinischen Fachgesellschaften (AWMF). Patientenleitlinie zur Nationalen Versorgungsleitlinie KHK. January 2017.